Honoring the great athletes from Cambria County. Pat Pecora with the 1996 NCAA Division II team national championship plaque. Pat Pecora offers advice to NCAA six-time national champion Carlton Haselrig. Both men are Cambria County Sports Hall of Famers. Pat Pecora coaches a Mountain Cats wrestler. Pat Pecora watches his wrestler make a move. Pat Pecora discusses strategy with UPJ wrestler Larry Hohman, as assistant coach Rob Yahner listens, left to right. Pat Pecora, right, addresses his squad in the original UPJ wrestling room at the Sports Center. Built a national power at Pitt-Johnstown, taking over the second-year program in 1976. 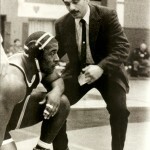 Became first NCAA Division II wrestling coach with 500 dual meet victories. Through 2017-18, his 581 dual-meet wins ranked second all-time in all collegiate divisions. 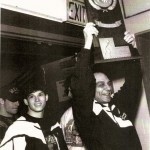 Led Pitt-Johnstown team to NCAA Division II national championships in 1996 and 1999. Twice named Division II National Coach of the Year. 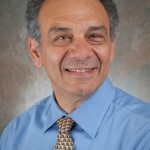 His teams captured 21 NCAA Regional Championships. Produced 14 individual national champion wrestlers who have combined to win 21 national tites through 2018 and had 149 All-Americans in that span. Coached well over 100 NWCA All-Academic Wrestling Team selections through 2018. UPJ team finished in the Top-10 22 times and Top-20 in the nation 34 times through 2018 and combined to win 49 team tournaments and 581 dual meets through the 2017-18 season. Assumed role as Athletic Director at Pitt-Johnstown in 2008. Served as the NCAA Division II Representative for the National Wrestling Coaches Association (NWCA), a duty previously held for 10 years entering 2011-12. Served as NWCA president for two terms. A member of eight halls of fame, including the Pennsylvania Sports Hall of Fame-East Boro Chapter (1994), West Liberty State College Hall of Fame (1998), Pennsylvania Wrestling Coaches Hall of Fame (2001), NCAA Division II Wrestling Hall of Fame (2003), Pitt-Johnstown Athletics Hall of Fame (2015), Western Chapter Pennsylvania Sports Hall of Fame (2016), and Pennsylvania Chapter National Wrestling Hall of Fame (2017), as well as the Cambria Hall. Get the latest CCSHOF news delivered to your inbox!